In China, local and import PP prices have been trading almost on par since late March. According to ChemOrbis Price Wizard, this situation has started to change over the past two to three weeks and the locally held prices regained their premium over imports. Import homo-PP prices have been under downward pressure coming from the lower crude oil, naphtha and propylene prices. Crude oil prices traded mostly below $40/bblthis week before recovering slightly over this threshold as the week drew to an end. Meanwhile, Asian naphtha prices shed $45/ton on the week and spot propylene pricesin Asia recorded around $150/ton drops when compared to the previous week. However, the drop on January PP futures on the Dalian Commodity Exchange was smaller given the Chinese Central Bank’s decision to pump 150 billion Yuan ($23.4 billion) into the market in order to offset the effects of increasing capital outflows from a weakening economy and declining stock market. The bank also cut its one-year lending rate and one-year deposit rate by 25 basis points. Apart from the bearish upstream developments, the recent devaluation of the Chinese Yuan has also been affective on weakening the demand for US denominated imports and players mostly turned to the local market, where they can meet their urgent needs promptly. This situation also helped local prices regain their premium again. 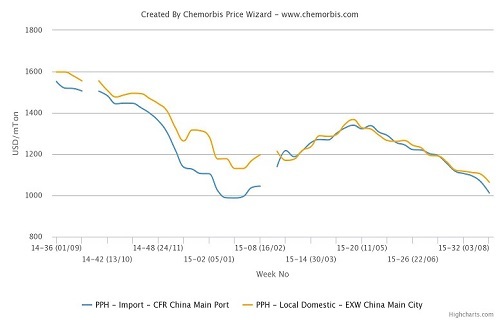 However, according to ChemOrbis, locally held PP prices appear to be under renewed downward pressure coming from the weaker import market, which may pull down the distribution market levels again.